Noreva Actipur Anti-Imperfections Day Care eradicates spots and blackheads. 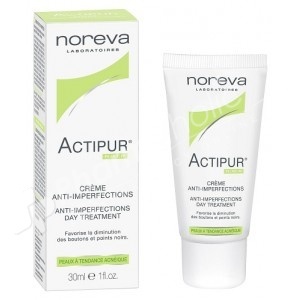 Designed to promote the reduction of pimples and blackheads on the skin of the face and neck, Actipur Crème anti-imperfections can slow down and regulate the production of sebum acne-prone skin of adolescents and adults. Thanks to a daily application, the skin is hydrated, matified, silky and regains its balance. Apply carefully on the affected area daily for at least 2 months (morning and evening) after first having cleaned and dried it. Aqua (Water), Cyclopentasiloxane, C12-15 Alkyl Benzoate, Butylene Glycol, Copolymer Acrylates, Peg / Ppg-18/18 Dimethicone, Sodium Chloride, Niacinamide, Cyclohexasiloxane, Tocopheryl Acetate, Dimethicone Crosspolymer, Sodium Lauroyl Lactylate, Ceramide 3, Ceramide 1 , Ceramide 6-Ii, Phytosphingosine, Cholesterol, Carbomer, Chlorphenesin, Xanthan Gum, Methylparaben, Propylparaben, Imidazolidinyl Urea, Fragrance, Limonene, Linalool, Hydroxycitronellal, Citral, Benzyl Salicylate, Alpha-Isomethyl Ionone, Hexyl Cinnamal, Citronellol.